Prunus incisa 'Kojo-no-mai' is a very small Fuji Cherry tree with unusual zig-zagging branches and masses of flowers. Just as winter ends in early March, 'Kojo-no-mai' bursts into life with an abundance of bright white, delicate looking little flowers that develop pink centres. The foliage is serrated (incised), with new foliage having a bronzed tinge and taking on a vivid orange colour in the autumn. This small bushy Fuji Cherry tree will achieve an estimated height and spread of about 2 x 2 metres in 20 years. The compact size and seasonal interest make it the perfect small garden or patio tree. It takes well to a hard prune, allowing you to keep the shape smaller and neater if you wish. 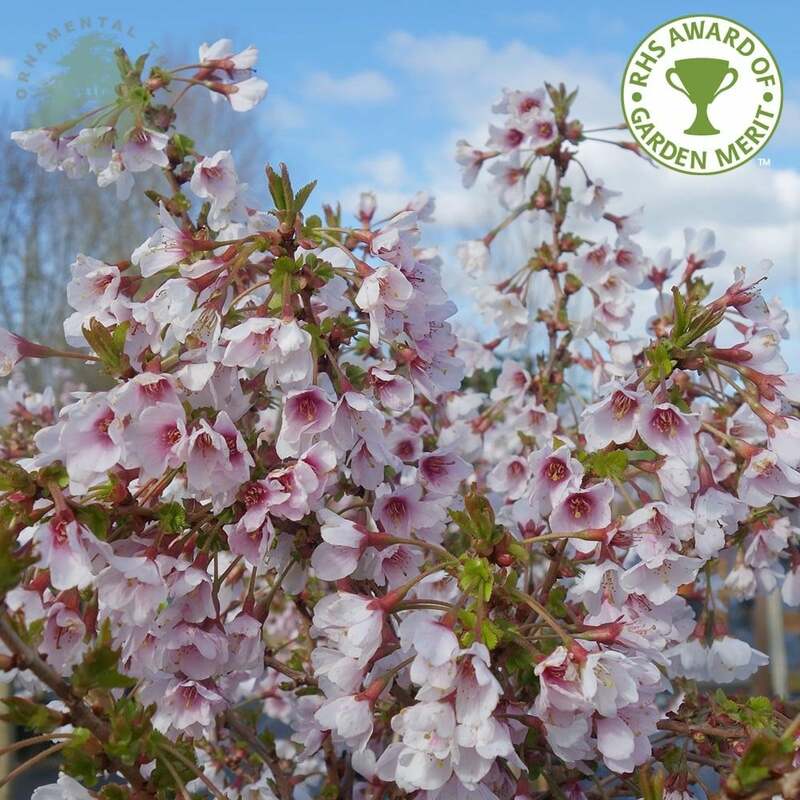 Thriving in sun or partial shade as long as the soil is well-drained, Prunus incisa 'Kojo-no-mai' is very popular and deservedly holds the RHS Award of Garden Merit. If you want a larger Fuji Cherry tree, take a look at Prunus incisa 'Mikinori', Prunus incisa f yamadei and Prunus incisa 'The Bride'. Our pot grown Kojo-no-mai Fuji Cherry trees can be planted at any time of the year. Kojo-no-mai is ideal for growing in a patio pot or in the garden - choose a location away from strong winds to protect the blossom. If planting in the garden, start by digging a square hole as deep as your root mass and approximately 1.5x as wide. To help the tree establish, sprinkle root grow in the hole. Remove the production pot, gently loosen the roots and place into the planting hole. Mix 50% of the original soil with 50% compost, fill in the hole and firm around gently. Avoid banking the soil up around the collar of the tree. We recommend planting Fuji Cherry trees (except bush forms) with a stake and tie to ensure the roots are well anchored - instructions are in the planting guide. Although it is possible to leave your Kojo-no-mai Fuji Cherry tree to its own devices, if you prune it for the first few years it will create a more balanced branch framework. Prune after flowering i.e. after the petals have dropped but before the new shoot growth appears.